By the time David Axelrod began work on his debut album Songs Of Innocence in 1968, the thirty-seven year arranger, composer, drummer and producer old had enjoyed a chequered career. He had started off as a boxer, before changing direction and finding work in film and television. However, in 1959 David Axelrod embarked upon a musical career when he produced Harold Land’s album The Fox. This launched David Axelrod’s nascent musical career. David Axelrod wrote and arranged Mass in F Minor and Release of an Oath for the psychedelic rock band The Electric Prunes. The only problem was that both songs were complex pieces of music. Mass in F Minor consists of a mass sung in Latin and Greek and performed in a psychedelic style. However, there was a problem, it was too complex a piece for The Electric Prunes to record and it was recorded by David Axelrod’s band. This lead to The Electric Prunes disbanding and David Axelrod’s band completed the albums. Executives at Capitol Records were grateful that David Axelrod had rescued what was a particularly tricky situation, and wanted to reward him for his recent success. This resulted in David Axelrod being allowed to record his debut solo album Songs Of Innocence which was recently reissued by Now Again Records. David Axelrod had been watching trends in popular music and realised that there was a new breed of record buyer with much more sophisticated taste than the three chord pop of the early Beatles’ record. They were willing to embrace and buy much more experimental sounding albums, including two of the best known, The Beach Boys’ Pet Sounds and The Beatles’ Sgt Peppers Lonely Hearts Club Band. Both of these experimental had been hugely successful, and was proof to David Axelrod that there was a demand for this type of music. Seamlessly David Axelrod’s rock orchestra changed direction and were transformed into a vampish big band. Other times, they played bluesy bop or locked into a jazzy groove and on occasions started to swing. Meanwhile, producer David Axelrod was constantly encouraging his band to experiment, and not be afraid to improvise. Towards the end of recording sessions, David Axelrod’s rock orchestra had fully embraced psychedelia deploying organ licks that seemed to be designed to disorientate and gritty guitars. Then as The Mental Traveler was recorded, David Axelrod was keen to embrace and experiment with atonality. However, he felt that music that lacks a tonal centre of key was a step too far even on such an ambitions and innovative album as Songs Of Innocence. Sadly, when Songs Of Innocence was released in October 1968, AM and FM radio stations started playing the title-track and Holy Thursday, which became the best known track on the album. However, despite being played on radio, Songs Of Innocence wasn’t the commercial success that David Axelrod or executives at Capitol Records had hoped. 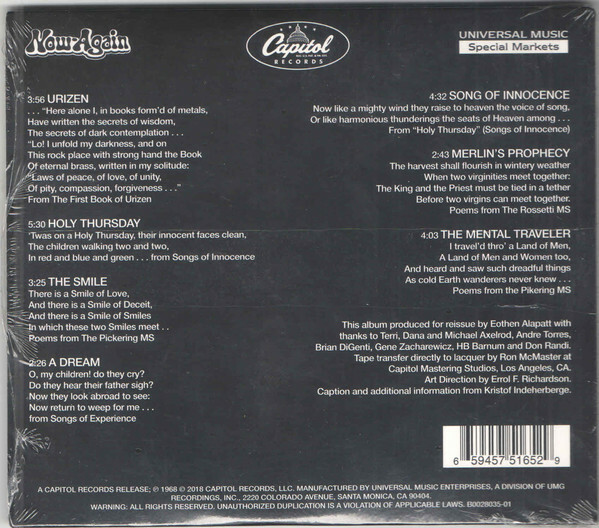 By October 1969, Songs Of Innocence had only sold 75,000 copies in America. It was the best part of twenty-five years before critics reassessed the oft-overlooked Songs Of Innocence, and realised that it was a groundbreaking and timeless release that was unlike nothing else that had been released in the late-sixties. Maybe the problem was that Songs Of Innocence was way ahead of its time? If that was the case, a new audience was discovering David Axelrod’s Songs Of Innocence. This soon included many DJs and producers who realised that David Axelrod’s Songs Of Innocence was a rich source of samples. One of the producers who sampled Songs Of Innocence was DJ Shadow who sampled the album for his debut album Endtroducing. Soon, the DJs and producers who were sampling Songs Of Innocence were championing David Axelrod’s music and especially his debut album, which was soon well on its way to becoming a cult classic. 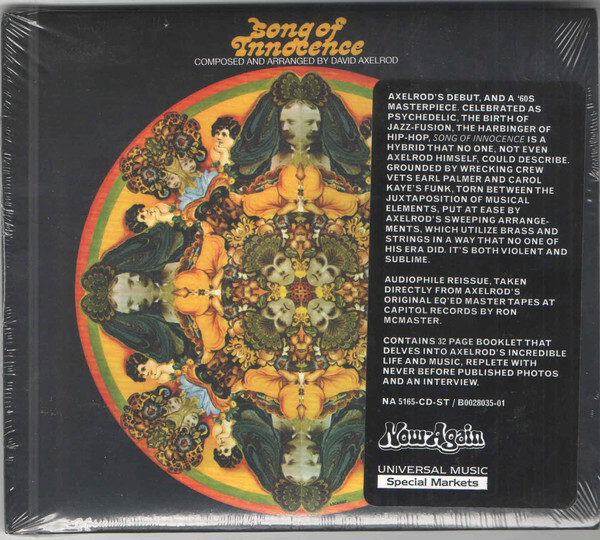 Now fifty years after David Axelrod released his debut album Now Again Records have reissued Songs Of Innocence on CD and LP. The album was initially reissued for Record Store Day 2018 as a limited edition, but is now available for a wider audience to discover or rediscover. This is a welcome and overdue reissue of Songs Of Innocence, which will be followed by a reissue of David Axelrod’s sophomore album Songs of Experience. It’s another highlight of David Axelrod’s long and illustrious career. Sadly, David Axelrod didn’t live to see this latest resurgence of interest in his solo career. One of music’s pioneers passed away on February the ‘5th’ 2017, aged eighty-six. However, David Axelrod left behind a rich musical legacy, including the trio of albums he recorded for Capitol Records. This included his debut album Songs Of Innocence, which is an ambitious, cerebral and innovative album that for far too long was overlooked by critics and record buyers. That is no longer the case. Somewhat belatedly, this genre-melting cult classic, which is a mixture of music, mysticism and philosophy is finally starting to find the wider audience who understand and appreciate David Axelrod’s timeless, psycheliturgical opus Songs of Experience, which was inspired by his hero, poet William Blake.